President Donald Trump makes a statement on the administration's strategy for dealing with Iran in the Diplomatic Reception Room in the White House on Friday. Thank you very much. My fellow Americans: As President of the United States, my highest obligation is to ensure the safety and security of the American people. History has shown that the longer we ignore a threat, the more dangerous that threat becomes. For this reason, upon taking office, I've ordered a complete strategic review of our policy toward the rogue regime in Iran. That review is now complete. Today, I am announcing our strategy, along with several major steps we are taking to confront the Iranian regime's hostile actions and to ensure that Iran never, and I mean never, acquires a nuclear weapon. Iran is under the control of a fanatical regime that seized power in 1979 and forced a proud people to submit to its extremist rule. This radical regime has raided the wealth of one of the world's oldest and most vibrant nations, and spread death, destruction, and chaos all around the globe. Iranian proxies provided training to operatives who were later involved in al Qaeda's bombing of the American embassies in Kenya, Tanzania, and two years later, killing 224 people, and wounding more than 4,000 others. The regime harbored high-level terrorists in the wake of the 9/11 attacks, including Osama bin Laden's son. In Iraq and Afghanistan, groups supported by Iran have killed hundreds of American military personnel. The Iranian dictatorship's aggression continues to this day. The regime remains the world's leading state sponsor of terrorism, and provides assistance to al Qaeda, the Taliban, Hezbollah, Hamas, and other terrorist networks. It develops, deploys, and proliferates missiles that threaten American troops and our allies. It harasses American ships and threatens freedom of navigation in the Arabian Gulf and in the Red Sea. It imprisons Americans on false charges. And it launches cyberattacks against our critical infrastructure, financial system, and military. The United States is far from the only target of the Iranian dictatorship's long campaign of bloodshed. The regime violently suppresses its own citizens; it shot unarmed student protestors in the street during the Green Revolution. This regime has fueled sectarian violence in Iraq, and vicious civil wars in Yemen and Syria. In Syria, the Iranian regime has supported the atrocities of Bashar al-Assad's regime and condoned Assad's use of chemical weapons against helpless civilians, including many, many children. Given the regime's murderous past and present, we should not take lightly its sinister vision for the future. The regime's two favorite chants are "Death to America" and "Death to Israel." 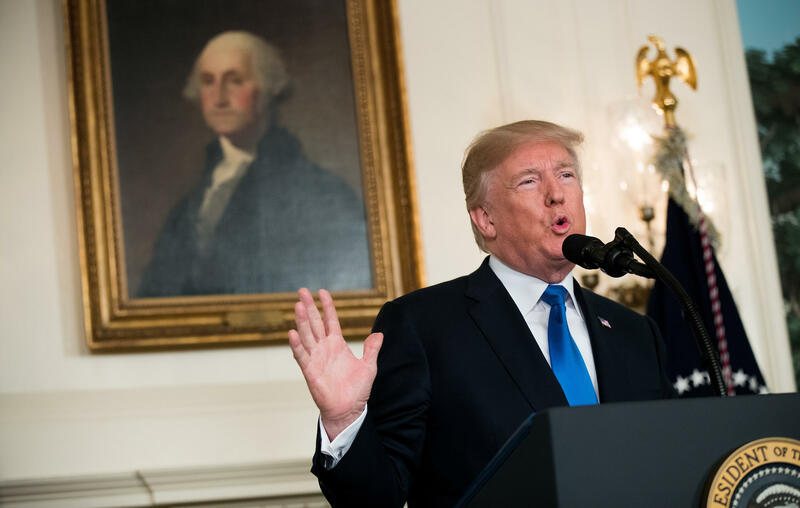 Realizing the gravity of the situation, the United States and the United Nations Security Council sought, over many years, to stop Iran's pursuit of nuclear weapons with a wide array of strong economic sanctions. As I have said many times, the Iran Deal was one of the worst and most one-sided transactions the United States has ever entered into. The same mindset that produced this deal is responsible for years of terrible trade deals that have sacrificed so many millions of jobs in our country to the benefit of other countries. We need negotiators who will much more strongly represent America's interest. The nuclear deal threw Iran's dictatorship a political and economic lifeline, providing urgently needed relief from the intense domestic pressure the sanctions had created. It also gave the regime an immediate financial boost and over $100 billion dollars its government could use to fund terrorism. Worst of all, the deal allows Iran to continue developing certain elements of its nuclear program. And importantly, in just a few years, as key restrictions disappear, Iran can sprint towards a rapid nuclear weapons breakout. In other words, we got weak inspections in exchange for no more than a purely short-term and temporary delay in Iran's path to nuclear weapons. What is the purpose of a deal that, at best, only delays Iran's nuclear capability for a short period of time? This, as President of the United States, is unacceptable. In other countries, they think in terms of 100-year intervals, not just a few years at a time. The saddest part of the deal for the United States is that all of the money was paid up front, which is unheard of, rather than at the end of the deal when they have shown they've played by the rules. But what's done is done, and that's why we are where we are. The Iranian regime has committed multiple violations of the agreement. For example, on two separate occasions, they have exceeded the limit of 130 metric tons of heavy water. Until recently, the Iranian regime has also failed to meet our expectations in its operation of advanced centrifuges. Iranian officials and military leaders have repeatedly claimed they will not allow inspectors onto military sites, even though the international community suspects some of those sites were part of Iran's clandestine nuclear weapons program. By its own terms, the Iran Deal was supposed to contribute to "regional and international peace and security." And yet, while the United States adheres to our commitment under the deal, the Iranian regime continues to fuel conflict, terror, and turmoil throughout the Middle East and beyond. Importantly, Iran is not living up to the spirit of the deal. So today, in recognition of the increasing menace posed by Iran, and after extensive consultations with our allies, I am announcing a new strategy to address the full range of Iran's destructive actions. First, we will work with our allies to counter the regime's destabilizing activity and support for terrorist proxies in the region. Third, we will address the regime's proliferation of missiles and weapons that threaten its neighbors, global trade, and freedom of navigation. The execution of our strategy begins with the long-overdue step of imposing tough sanctions on Iran's Islamic Revolutionary Guard Corps. The Revolutionary Guard is the Iranian Supreme Leader's corrupt personal terror force and militia. It has hijacked large portions of Iran's economy and seized massive religious endowments to fund war and terror abroad. This includes arming the Syrian dictator, supplying proxies and partners with missiles and weapons to attack civilians in the region, and even plotting to bomb a popular restaurant right here in Washington, D.C. I am authorizing the Treasury Department to further sanction the entire Islamic Revolutionary Guard Corps for its support for terrorism and to apply sanctions to its officials, agents, and affiliates. I urge our allies to join us in taking strong actions to curb Iran's continued dangerous and destabilizing behavior, including thorough sanctions outside the Iran Deal that target the regime's ballistic missile program, in support for terrorism, and all of its destructive activities, of which there are many. Finally, on the grave matter of Iran's nuclear program: Since the signing of the nuclear agreement, the regime's dangerous aggression has only escalated. At the same time, it has received massive sanctions relief while continuing to develop its missiles program. Iran has also entered into lucrative business contracts with other parties to the agreement. When the agreement was finalized in 2015, Congress passed the Iran Nuclear Agreement Review Act to ensure that Congress's voice would be heard on the deal. Among other conditions, this law requires the President, or his designee, to certify that the suspension of sanctions under the deal is "appropriate and proportionate" to measure — and other measures taken by Iran to terminate its illicit nuclear program. Based on the factual record I have put forward, I am announcing today that we cannot and will not make this certification. We will not continue down a path whose predictable conclusion is more violence, more terror, and the very real threat of Iran's nuclear breakout. That is why I am directing my administration to work closely with Congress and our allies to address the deal's many serious flaws so that the Iranian regime can never threaten the world with nuclear weapons. These include the deal's sunset clauses that, in just a few years, will eliminate key restrictions on Iran's nuclear program. The flaws in the deal also include insufficient enforcement and near total silence on Iran's missile programs. Congress has already begun the work to address these problems. Key House and Senate leaders are drafting legislation that would amend the Iran Nuclear Agreement Review Act to strengthen enforcement, prevent Iran from developing an inter- — this is so totally important — an intercontinental ballistic missile, and make all restrictions on Iran's nuclear activity permanent under U.S. law. So important. I support these initiatives. As we have seen in North Korea, the longer we ignore a threat, the worse that threat becomes. It is why we are determined that the world's leading sponsor of terrorism will never obtain nuclear weapons. In this effort, we stand in total solidarity with the Iranian regime's longest-suffering victims: its own people. The citizens of Iran have paid a heavy price for the violence and extremism of their leaders. The Iranian people long to — and they just are longing, to reclaim their country's proud history, its culture, its civilization, its cooperation with its neighbors.